I am the one wearing my costume. The idea came from a movie I saw which was originally a game called Silent Hill. 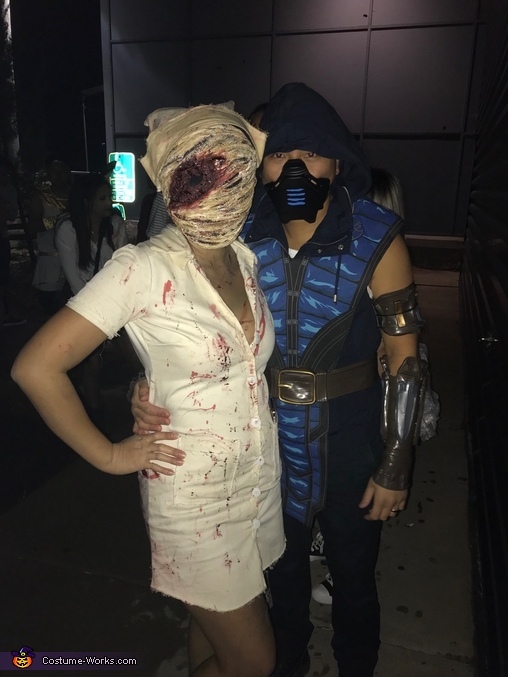 I made the whole costume top to bottom excluding the shoes which were just white sneakers from Target that I bloodied and dirtied up. I went and bought the fabric, pattern, buttons, plaster gauze, and the shoes. The Pattern was for a button up dress which I adjusted the lengths and added big buttons to the front and made front pockets for instead of side pockets. With the left over fabric I made the nurse hat. I soaked everything in coffee to stain it and not make it look so white then added blood and brown make up to make it look for gory . The mask was made using my face and plaster gauze. I layered the plaster to get a base mask, dried it then added more gauze to it to add depth to it. I then brushed over it with coffee and paint and added fake blood. On the inside there is black mess fabric to block out the whole and make them less visible. I also padded parts of the mask on the inside with cotton balls to have it sit a little better on my face.